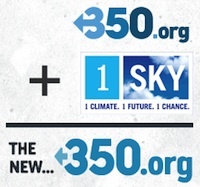 We're proud to announce that the 1Sky campaign and 350.org have merged into a new organization. We’ll be called 350.org, and together we’ll be smarter, bolder, faster, and more creative than we were before. Find out more about this exciting merger and how you can stay involved with the climate movement at 350.org. Please support our continued work for a healthy climate and clean energy future by giving at 350.org/donate.